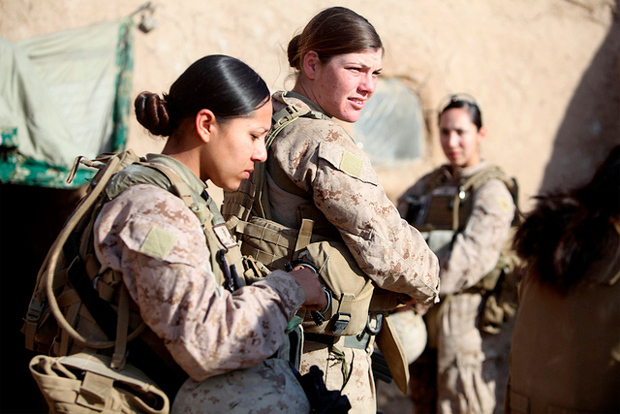 Female Marines on foot patrol in Marjah, Afghanistan: Marine Corps PhotoThe Department of Defense is expected to release a report on Thursday urging Congress to let women serve in more frontline combat-related jobs, signaling a possible death knell for male-only military units. The recommendations are part of a department-wide “Women in Service” review that was scheduled to be released last April but has been held up for nearly a year by DOD officials. Military representatives will hold a Pentagon press conference Thursday afternoon to announce the changes. Although the new rules aren’t expected to allow women into all combat roles currently held by men, such as infantry, artillery, and special operations, they will certainly boost the case for full equality in the ranks. According to DOD officials who have briefed journalists on the report, it will recommend that women be allowed to fill essential non-combat roles—medics, cops, intelligence and communications specialists—in small, frontline combat units where they were previously forbidden. Specifically, it has to do with jobs that put them down into our maneuver battalions, such as intelligence officers, signal officers, other specialties that now are not allowed to be in combat battalions. We need them there. We need their talent. This is about managing talent. We have incredibly talented females who should be in those positions. Translation: Our military readiness has been suffering all along, because qualified women are barred from doing their jobs where they’re needed most! Long story short: Expect to hear a minor ruckus from the usual conservative circles on this issue. Maginnis et. al. will continue to beat the drums. The “Center for Military Readiness,” an alias for Reagan acolyte Elaine Donnelly, will probably lambaste women in the military as soon as it’s done lambasting Mitt Romney for not being sufficiently anti-gays-in-the-military. But given Americans’ collective “meh” about ending DADT, and voters’ willingness to trust military leaders when it comes to military hiring decisions, full gender equity in the ranks is no longer a question of “if” but “when.” Strange how conservatives, concerned as they are about military readiness, can be so bad when it comes to choosing their battles.